Jo from Tri50, will again be offering a range of swim coaching services at Heron Lake this season. 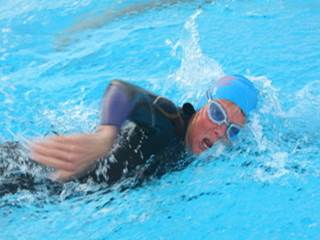 Jo has been coaching swimming, and triathlon, for 36 years and brings with her a wealth of experience. From introducing tiny tots to the water, to adults wishing to experience Open Water in the Autumn of their years. She especially enjoys working with nervous and apprehensive adults who are totally new to open water and have a real fear of the transition from swimming pool to the murky waters of lakes, reservoirs, rivers, and rough seas. Working at a swimmer’s own pace and putting him/her at ease straight away, without forcing them into uncomfortable situations too quickly is also one of her strong qualities . Jo is well renowned for her unending patience, listening skills and gentle encouragement, combined with a sense of humour, to transforming swimmers who thought they would never take to open water – many have gone on to successfully train for long open water endurance events, knowing that their stroke technique has been corrected, and the necessary open water skills relentlessly practised, under her experienced and watchful eye. Jo still competes herself at International level in Triathlon, Aquabike, and Aquathlon, and shares her many years of competing with her swimmers – there aren’t many difficult open water situations Jo hasn’t been faced with, and she uses her experience to assist others. Infact, Jo now gets more fulfilment from seeing her athletes overcome their fears and achieve their personal goals, than she does from travelling to far flung places to compete herself. Her most recent sporting accolade is winning a Bronze Medal in the debut World Aquabike Championships held in Pentincton, Canada, last August – long course distance of a 3km swim followed by 125kms cycle. She still likes to prove to herself that she can still train and race! and also First Aid qualified. Coached sessions, either 1-2-1 or a small group. Ideal for nervous/newbie Triathletes wishing to learn about Open Water. Women only sessions on the first Wednesday of every month. Open Water Skills session for Triathletes/Swimmers preparing for the 2019 race season. Refresher sessions for Triathletes/Swimmers who have lapsed with open water swimming for a few years or who have lost their confidence. This list is not an exhaustive list, Jo will happy to tailor sessions to your own individual need just get in touch to have a chat and discuss your own personal requirements.